William and Kate kicked off another day of engagements with a call on the Prime Minister and members of the Cabinet at the Prime Minister's office. 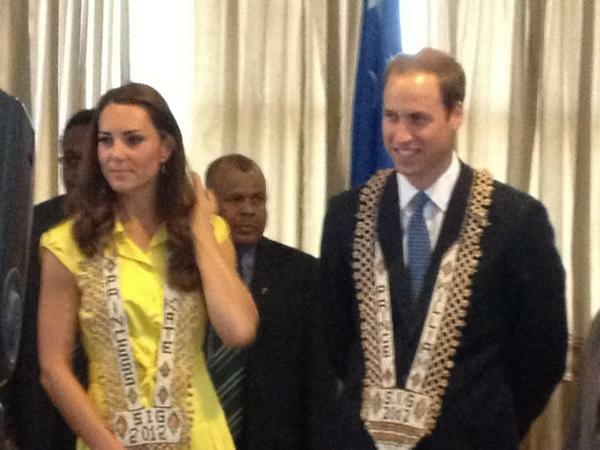 The couple wore gift necklaces presented to them by the PM with "Princess Kate" and "Prince William" emblazoned on them. Kate's official title is Duchess of Cambridge but as the informative @MaxFoster CNN noted "Official titles aren't everything". It's a beautiful gift. Following the meeting, the couple travelled to a cultural village, Burns Creek, in Honiara where they viewed performances by the nine provinces that make up the nation. Each performance was given in front of a house built in accordance with the traditions of that particular province. William and Kate watched Island warriors doing fearsome traditional dances to the sound of pan pies. 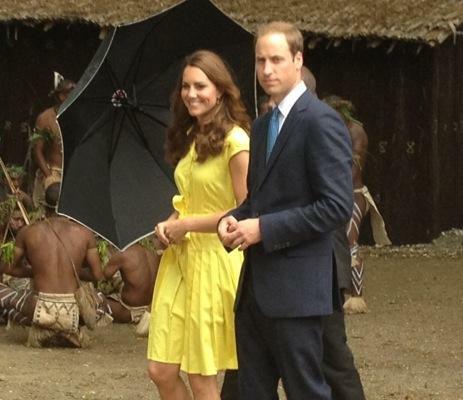 The Cambridges braved the rain to learn more about village life and poverty in the Solomon Islands. William and Kate broadened their understanding of aid and development in the South Pacific when they met community members such as Louise Whitney and her baby who are working their way out of poverty with the help of World Vision. Louise has survived an abusive relationship and with business training is now able to support her family with a store. Louise said she was "so excited to meet the Duchess and tell her all about my little shop in Burns Creek." The Duke and Duchess also met Ellison Maitaifiri who works with youth in the nearby Burns Creek settlement. 'They greeted me like we'd met before. I told them about our community savings project. They asked lots of questions. They wanted to know why we didn't go to the bank and I explained that people can't read or write. I was so honoured to meet them. Last night I couldn't go to bed early. 'Our community has never seen a couple like that before, and they got to shake their hands. For the past few years we haven't felt part of Honiara. Today we feel powerful and we feel recognized'. World Vision has been working with the community for the past eighteen months to change attitudes towards substance abuse and violence, and to create opportunities for youth through education and training. 'We are honoured to host such an influential pair of young leaders. Our goal is that they'll walk away with an understanding about how we are empowering communities to overcome poverty in the Solomon Islands'. Put simply, World Vision is building a better world for children and it would be wonderful to see the charity highlighted. No doubt this is exactly where William and Kate would wish the spotlight to focus. 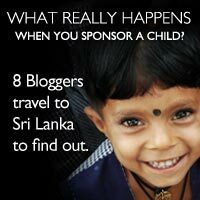 If you wish to sponsor a child you can find all relevant information here. For about $1 a day, you'll provide children in need with access to life-saving basics such as clean water, nutritious food, healthcare and education. You can also visit the World Vision Online Shop. 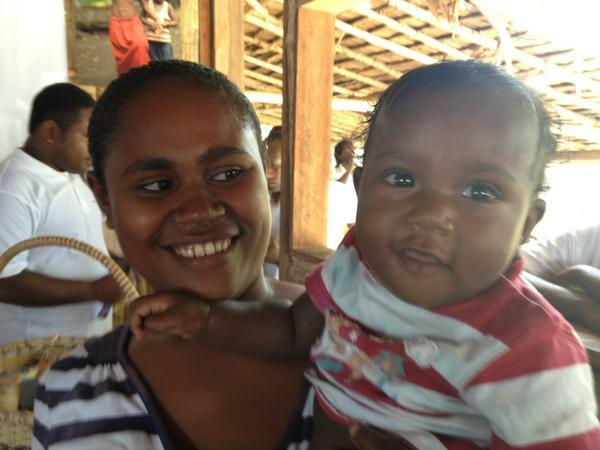 You can follow World Vision News via Twitter and Facebook. The World Vision Blog is an insightful and fascinating read. 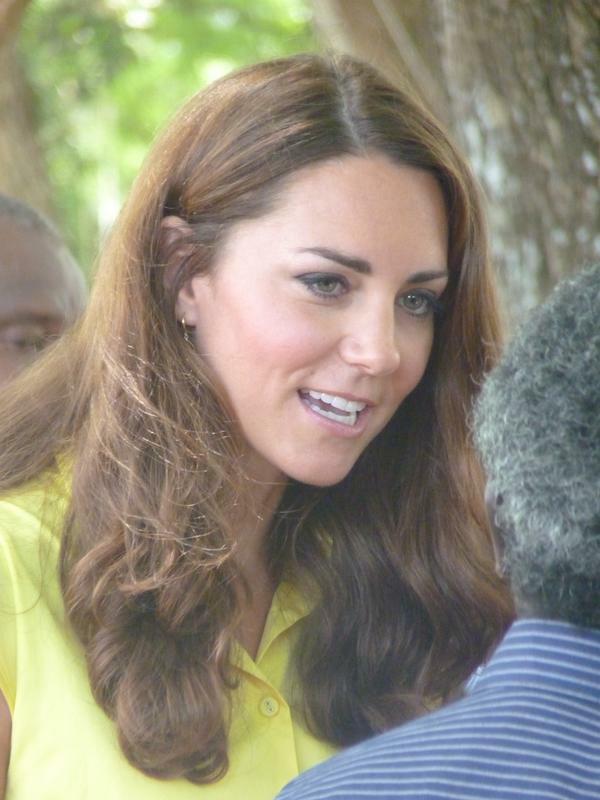 Royal reporter Rebecca English said both William and Kate thoroughly enjoyed their visit and meeting the locals. A lovely shot of Kate. Kate wore the Pleated Shirted Dress today by British brand Jaeger (with many thanks to Tammie who ID'd the dress via WKW FB). 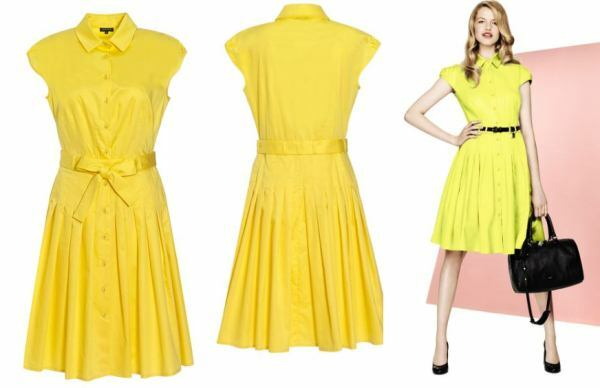 The summer dress features cap sleeves, shirt collar, belt loops and button fastening through the front. The lightweight dress has a full skirt and soft pleating throughout. It is currently reduced from £180 to £75. The dress is similar to the primrose yellow Jenny Packham dress Kate wore in Calgary during the royal tour in July 2011. The lovely Carly from Kate Middleton Style noted the Jaeger dress was a great alternative at the time. Excellent prediction! 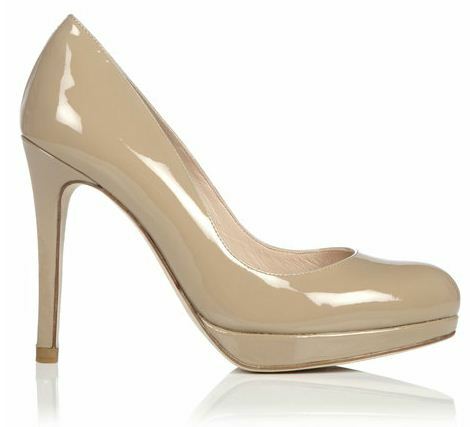 Kate wore her trusty LK Bennett Sledge Pumps. 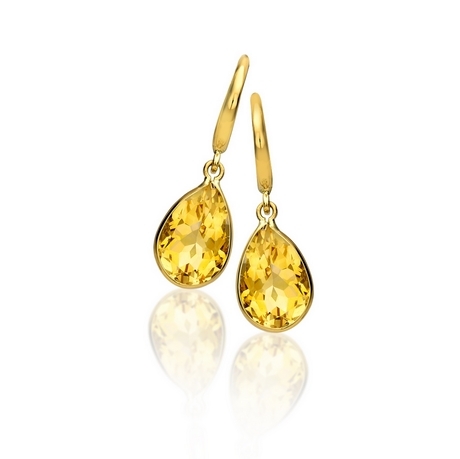 Kate accessorized with her Kiki McDonough Citrine Drop Earrings. They are available for £495. Afterwards, the couple had separate engagements. William briefly attended a conference given for youth leaders from the Commonwealth leaders in the Pacific where he was invited to make some short remarks. The Duke subsequently awarded six Duke of Edinburgh Gold Awards to Solomon Islanders and one awardee from Vanuatu. 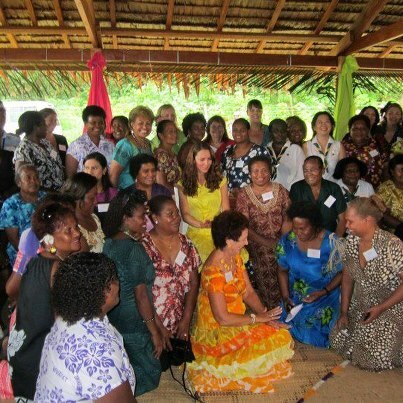 Meanwhile, Kate attended a reception for Solomon Islands women's groups. William was given a baseball cap and Kate a beautiful exotic headdress. I always find tidbits of information from the tour interesting and thought I would share one from Royal commentator Robert Jobson. 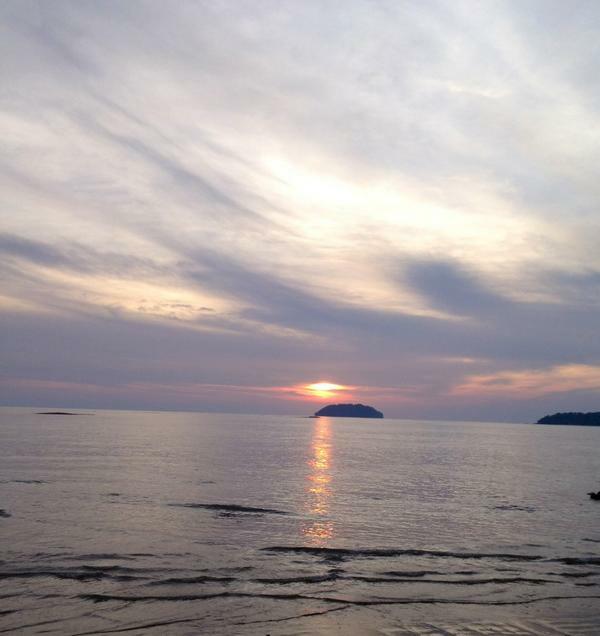 Robert spoke with the general manager of the Shangri-La resort in Kota Kinabalu who told him when William and Kate left they said "We wished we could have stayed longer". Hello! Kate looks like sunshine today! She is always dressed like a lady and her dresses are so feminine! What makes me love the necklace is the fact that is written "princess" on it! Looking forward the next engagements! Thank you for the wonderful work, Charlotte. I hope you're having a great night! Everything she wore are look so beautiful although is simple. Another lovely post, as usual :) The necklace is great - I feel like Kate would love the title on it. There is something casual and friendly about her being called "Princess Kate". I am always impressed at Kate's ability to stand or walk long distances in her high heels, and today she showed a new talent - walking the rainforest in her sledges! She looks poised and graceful as always. I was wondering a few days ago when their separate engagements were scheduled and was hoping some of the recent turmoil would subside by the time they had to be apart. It seems as though a weight has been lifted from their shoulders in the last few days, and I am glad they didn't have to be apart until now. Wow again your fast. Thanks for this great up date. The Duchess looks beautiful in her yellow dress. They both look relaxed but the Duchess looks a little tired. I bet when they get home we will not see them for awhile. With everything that has gone on in their lives the past few days, they will need the break. The tour is very demanding and with the stress of the pictures they have handled it very well. William will make sure that this will never happen to his beautiful Duchess again. This will make their marraiage even stronger if that is possible. Now let's get on with the tour! I love Catherine in the colour yellow it is so uplifting. I wish Kate didn't play with her hair so much I suppose it is a nervous habit but it's really in too many photos that is why she should wear her hair up more. Anyways as usual she looks gorgeous. William is back in a suit again! :( They were looking so happy and relaxed in the rain forests and Solomon Islands!!! Wouldn`t it be lovely if all of us, Charlotte`s blog followers from all over the world, could have a get together and treat Charlotte to a lovely dinner? That would be something, wouldn`t it? On another note, I'm seriously touched by the work of World Vision, really hope the royal visit highlights it. I am myself a sponsor of World Vision. I am delighted to see William and Kate so interested in their work. I hope it will become one of their charities. The photos of the royal couple with the people and the little children there are very touching. Thank you so much Charlotte! Keep up your excellent work! I am amazed how Charlotte has been able to bring us the most up to date photos and news of Kate. Great job! I am also very impressed by Kate's maturity and quiet strength in handling all the nonsense going on around her now. Having said that, she looks a bit tired in the first pic, but I'm happy to finally see her in more bright colors. I would have loved to have seen some more recycled outfits like the lace McQueen dress she wore to Jubilee. Charlotte, thanks for the close up of the necklace. 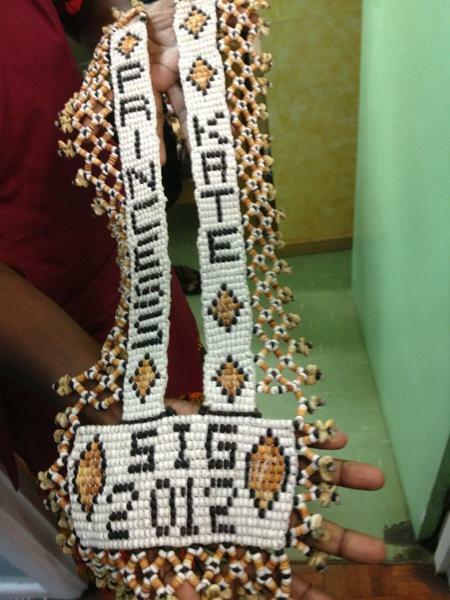 Wonderful beadwork! It actually looked good with her dress. I wonder whether she will be able to keep it when she goes home, or whether it will belong to the UK and go into a museum? Thanks again for the great and fast coverage! Man I find it crazy how they crucifying that girl over some pictures, its the same thing they did to Diana. Terry- All of this jsut has so pisst off. And just think how William feels about what they are doing to his wife. The same damn stuff they did to his beloved mother. This time though William will be able to do something about it. What I have read is he is hell bent on putting who ever is behind these pictures behind bars. And if anyone can do it William can. I jsut hope that William will have the security team looked at because these photos should never have been taken. The security team should have checked out all area around the compound where they were staying. That being said they should have partoled the area also 24/7. I have to take my hat off to both of them, how they have continued to care on with the tour with their heads hung high. The Duchess is a very strong woman. She will get through this with the love ans support of her Prince, the Queen and her family. I just wish it will settle down before they return home on Wednesday but I don;t think it will. I am sure they will go under the rader when they return. That is what they did last year when they returned from Canada. And that one was not as streeful as this one. Hate to say but this is my least favourite look so far. The dress looks really cheap and fussy, like something you see in Primark. She is not wearing pumps, she is wearing flats. Kate and Will looking very good. The Cambridges are standing up to all the travel and photo mess very well. I wish them a wonderful night on their own. Looking forward to the first photos from Tuvalu. Their jet touched down in Funafuti within the past half hour. I as well am an aspiring blog writer but I'm still new to everything. Do you have any suggestions for newbie blog writers? I'd really appreciate it. I'm sharing this on my Twitter... do you mind?